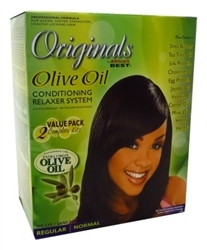 Welcome To An Improved No-Lye Relaxer System With Ultimate Organic Olive Oil Conditioning...Fortified And Enriched With Extra Virgin Olive Oil Organics By Africas Best Goes Beyond Relaxing By Reaching A Higher Level Of Conditioning And Moisturizing. Formulated With The Age Old Properties Of Extra Virgin Olive Oil Organics By Africas Best Helps Repair Rebuild And Restore Your Hair Whil Giving It Strength Shine And Softness. The Ultimate In Healthy Relaxed Hair!...With Organic Olive Oil Conditioning Youll Experience Soft Silky Straight Hair As Never Before.